The yellow coat of rail workers is disappearing. From 1 July 2019, the entire building will switch to orange work clothing. Never again a sea of yellow vests with a large rail project. Nobody sees the difference between a road worker and a rail worker. Why actually? The consequences for track builders are huge. 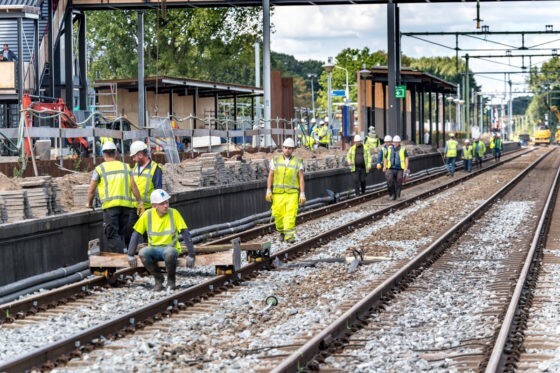 Companies such as Strukton, BAM and Volker Rail have to put a lot of effort into replacing all clothing for their rail division. At Strukton, for example, there are 1345 rail people who switch from yellow to orange, a further 566 employees now regularly change jackets and 32 safety people will wear yellow in the future. Ten pressing questions to safety expert Marcel Edwards, chair of the Safety Alert Working Group of Rail Alert. Why does the entire rail sector switch to orange vests? Do you no longer see a difference between a road worker and a rail worker? “That’s right. The safety clothing of road workers will no longer deviate from track workers from 1 July. Bright orange stands out just as well as bright yellow. And working safely, even under dark or wet conditions, is, of course, the whole idea behind safety clothing. Never again a yellow vest so? Are the safety people at the other construction sites also switching to yellow vests? What sanctions or fines apply after that time?